You must be a member of the Berlin Outdoor Activities Group to attend this activity. Would you like to join this group? 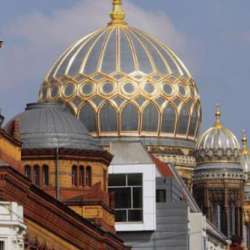 Experience old Berlin - small alleys, restored back yards, and old ballroom and Zille's milieu. While the old historic center of Berlin was destroyed in World War II and most of the buildings are reconstructions, the Scheunenvierten and Spandauer Vorstadt still have the real old houses from the 18th and 19th century. This neighborhood had also been the center of Berlin Jewish life and again houses important Jewish institutions. Neglected in socialist times, the Spandauer Vorstadt is beautifully restored today with cafés, shops and much more to explore. We will stop at some interesting sights and/or museums and find a stop for lunch on the way.